Muna’s long-time friend Tobi Neumann, who has one of the finest music studios you can find in Berlin, gave them this stunning analog monster track and they couldn’t be happier! His output is very rare and Muna Musik is honored to release his latest track “All His Soldiers”.With Muna Musik Mathias Kaden created a label that brings together like-minded and talented artists and friends. 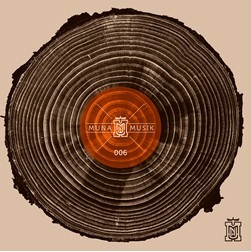 Muna 006 features tracks from Steve Bug, Tobi Neumann, Magit Cacoon und Uncanny Valley’s Jakob Korn. Muna also welcomes the “bundle of energy”, Magit Cacoon from Tel Aviv, to their Muna family. She is known for her releases on UponYou and adds a deep dancefloor killer to this EP–plus a digital bonus track, an emotional song for quiet moments at home. Steve Bug is one of these super talented guys who inspired the Muna club over the past 20 years with a multitude of releases on Raw Elements and Pokerflat. They finally got their hands on one of his amazing productions for Muna 006! Deep East German power from Dresden! Analog-genius Jakob Korn is working as a music teacher, besides his profession as dj, producer, label owner of Uncanny Valley and being a great person. Good thing there are still guys like him, who have passion and a deep understanding for real music.